Many older people worry about becoming more forgetful. They think forgetfulness is the first sign of Alzheimer's disease. In the past, memory loss and confusion were considered a normal part of aging. However, scientists now know that most people remain both alert and able as they age, although it may take them longer to remember things. A lot of people experience memory lapses. Some memory problems are serious, and others are not. People who have serious changes in their memory, personality, and behavior may suffer from a form of brain disease called dementia. Dementia seriously affects a person's ability to carry out daily activities. Alzheimer's disease is one of many types of dementia. neglecting personal safety, hygiene, and nutrition. People with dementia lose their abilities at different rates. Dementia is caused by many conditions. Some conditions that cause dementia can be reversed, and others cannot. Further, many different medical conditions may cause symptoms that seem like Alzheimer's disease, but are not. Some of these medical conditions may be treatable. Reversible conditions can be caused by a high fever, dehydration, vitamin deficiency and poor nutrition, bad reactions to medicines, problems with the thyroid gland, or a minor head injury. Medical conditions like these can be serious and should be treated by a doctor as soon as possible. Sometimes older people have emotional problems that can be mistaken for dementia. Feeling sad, lonely, worried, or bored may be more common for older people facing retirement or coping with the death of a spouse, relative, or friend. Adapting to these changes leaves some people feeling confused or forgetful. Emotional problems can be eased by supportive friends and family, or by professional help from a doctor or counselor. 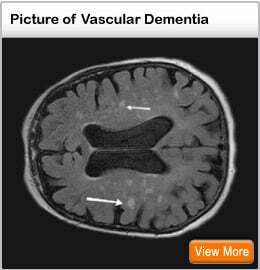 The two most common forms of dementia in older people are Alzheimer's disease and multi-infarct dementia (sometimes called vascular dementia). These types of dementia are irreversible, which means they cannot be cured. In Alzheimer's disease, nerve cell changes in certain parts of the brain result in the death of a large number of cells. Symptoms of Alzheimer's disease begin slowly and become steadily worse. As the disease progresses, symptoms range from mild forgetfulness to serious impairments in thinking, judgment, and the ability to perform daily activities. Eventually, patients may need total care. In multi-infarct dementia, a series of small strokes or changes in the brain's blood supply may result in the death of brain tissue. The location in the brain where the small strokes occur determines the seriousness of the problem and the symptoms that arise. Symptoms that begin suddenly may be a sign of this kind of dementia. People with multi-infarct dementia are likely to show signs of improvement or remain stable for long periods of time, then quickly develop new symptoms if more strokes occur. In many people with multi-infarct dementia, high blood pressure is to blame. One of the most important reasons for controlling high blood pressure is to prevent strokes. Diagnosis People who are worried about memory problems should see their doctor. If the doctor believes that the problem is serious, then a thorough physical, neurological, and psychiatric evaluation may be recommended. A complete medical examination for memory loss may include gathering information about the person's medical history, including use of prescription and over-the-counter medicines, diet, past medical problems, and general health. Because a correct diagnosis depends on recalling these details accurately, the doctor also may ask a family member for information about the person. Tests of blood and urine may be done to help the doctor find any problems. There are also tests of mental abilities (tests of memory, problem solving, counting, and language). A brain CT scan may assist the doctor in ruling out a curable disorder. A scan also may show signs of normal age-related changes in the brain. It may be necessary to have another scan at a later date to see if there have been further changes in the brain. Alzheimer's disease and multi-infarct dementia can exist together, making it hard for the doctor to diagnose either one specifically. Scientists once thought that multi-infarct dementia and other types of vascular dementia caused most cases of irreversible mental impairment. They now believe that most older people with irreversible dementia have Alzheimer's disease. Treatment Even if the doctor diagnoses an irreversible form of dementia, much still can be done to treat the patient and help the family cope. A person with dementia should be under a doctor's care, and may see a neurologist, psychiatrist, family doctor, internist, or geriatrician. The doctor can treat the patient's physical and behavioral problems and answer the many questions that the person or family may have. For some people in the early and middle stages of Alzheimer's disease, the drugs tacrine (Cognex), donepezil (Aricept), rivastigmine (Exelon), and galantamine (Reminyl) are prescribed to possibly delay the worsening of some of the disease's symptoms. Doctors believe it is very important for people with multi-infarct dementia to try to prevent further strokes by controlling high blood pressure, monitoring and treating high blood cholesterol and diabetes, and not smoking. Many people with dementia need no medication for behavioral problems. But for some people, doctors may prescribe medications to reduce agitation, anxiety, depression, or sleeping problems. These troublesome behaviors are common in people with dementia. Careful use of doctor-prescribed drugs may make some people with dementia more comfortable and make caring for them easier. A healthy diet is important. Although no special diets or nutritional supplements have been found to prevent or reverse Alzheimer's disease or multi-infarct dementia, a balanced diet helps maintain overall good health. In cases of multi-infarct dementia, improving the diet may play a role in preventing more strokes. Family members and friends can assist people with dementia in continuing their daily routines, physical activities, and social contacts. People with dementia should be kept up-to-date about the details of their lives, such as the time of day, where they live, and what is happening at home or in the world. Memory aids may help in the day-to-day living of patients in the earlier stages of dementia. Some families find that a big calendar, a list of daily plans, notes about simple safety measures, and written directions describing how to use common household items are very useful aids. Advice for Today Scientists are working to develop new drugs that someday may slow, reverse, or prevent the damage caused by Alzheimer's disease and multi-infarct dementia. In the meantime, people who have no dementia symptoms can try to keep their memory sharp. Developing interests or hobbies and staying involved in activities that stimulate both the mind and body. Giving careful attention to physical fitness and exercise also may go a long way toward keeping a healthy state of mind. Limiting the use of alcoholic beverages is important, because heavy drinking over time can cause permanent brain damage. Many people find it useful to plan tasks; make "things-to-do" lists; and use notes, calendars, and other memory aids. They also may remember things better by mentally connecting them to other meaningful things, such as a familiar name, song, or lines from a poem. Stress, anxiety, or depression can make a person more forgetful. Forgetfulness caused by these emotions usually is temporary and goes away when the feelings fade. However, if these feelings last for a long period of time, getting help from a professional is important. Treatment may include counseling or medication, or a combination of both. Some physical and mental changes occur with age in healthy people. However, much pain and suffering can be avoided if older people, their families, and their doctors recognize dementia as a disease, not part of normal aging.